It’s one thing to learn Japanese but another to find interesting content to read in the language. In a previous post, I wrote about the Kindle Paperwhite and its significance for Japanese learners. 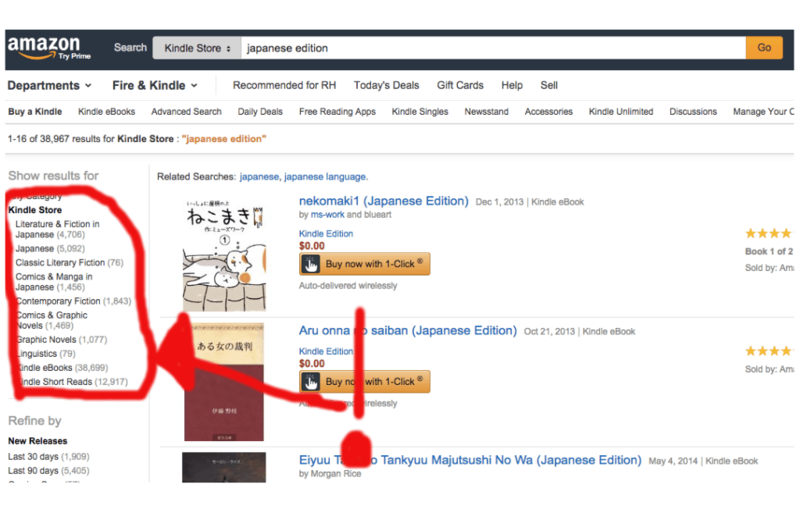 Since then, Amazon have made some progress in harmonizing much of the Japanese Kindle Store with the Amazon.com site. This is great news for Japanese learners around the globe. It is now possible to access Japanese language titles without all the previous hassle. From classic novels to manga in the original, there is a lot to choose from. So how can you find some good content to read in Japanese? By simply searching for “Japanese Edition” you will be presented with 240,000+ choices on Amazon. You can then navigate the menu in the top left of the screen to browse various categories and genres. Pretty impressive eh? If you know the book you are looking for, then input the title in English with our new friend “Japanese edition” following after. 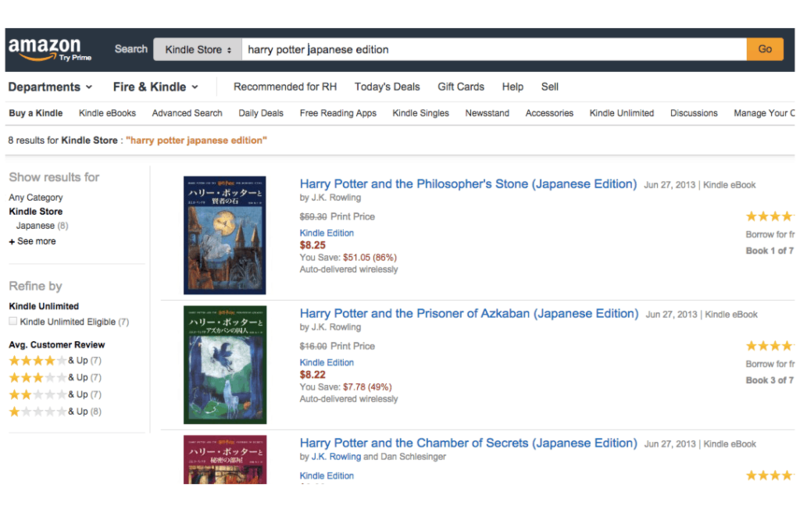 For example, if you wanted to read Harry Potter in Japanese, you would simply search for “Harry Potter Japanese Edition”, as shown below. It’s not a failsafe method, but if the book is relatively popular then this search alone should give you the full Japanese version. If inputting the English title doesn’t work, there is a small chance that the title exists on the Kindle Store but with its Japanese title. 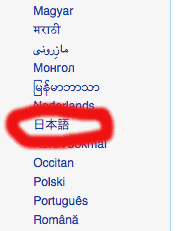 Find the Wikipedia entry for the book then switch to Japanese to get its Japanese title. Then copy and paste the title in the Kindle store to see if anything shows up. One strategy I have employed is to look at the Japan Kindle Store to see what is popular in the categories I enjoy reading about. You can then copy and paste the Japanese title to see if it is available on Amazon.com. This method is a bit hit and miss as many titles still aren’t sold outside of Japan, but it’s worth a try. In the case where you tried the exact title on Amazon.com and it isn’t available, then you can always set up an account on the Japan store and purchase content that way. It’s a pain, but it’s still better than the alternative – not being able to find anything you want. There is plenty of Japanese manga available too for those who enjoy it. Clearly, the boundaries that do remain are copyright-based rather than technological ones. Here’s to hope that Japanese publishers will begin to see the light. Happy reading folks! Did you find any interesting Japanese books lately? Let us know in the comments. Thanks for this helpful article. I love you guys! Do you have any book recommendations of your own? They can be read on a regular English kindle. Really grateful for this information. This is a significant step by Amazon. But still I hope they could soon attach the original Japanese titles to each book. Since it’s Japanese (learners) who are searching for Japanese books, there is no way that they don’t understand Japanese. I am a native Mandarin speaker and inputting alphabets to search for Japanese titles is just not that convenient and intuitive for me. Using alphabets to search for Japanese titles is, for me, like using Chinese pinyin to search for English titles – very unnatural. Thank you for sharing this information anyway. Look forward to more progress from Amazon to improve the experience of the multi-language readers! I didn’t know you could buy Japanese Kindle books on the US store. That’s great news! Thanks for the tip. Sorry Does the Kindle need to be purchased in Japan to read Japanese books or could a UK Kindle work fine?Also if so will any Kindle model work? As far as I know, the newer Kindle models all support Japanese ebooks. You don’t need to buy a Kindle in Japan.